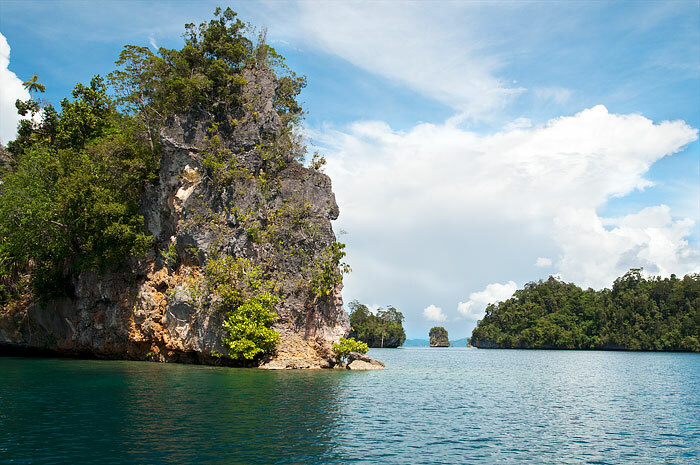 The Pulau Wayag seascape of conical karst islands is Raja Ampat’s poster child. 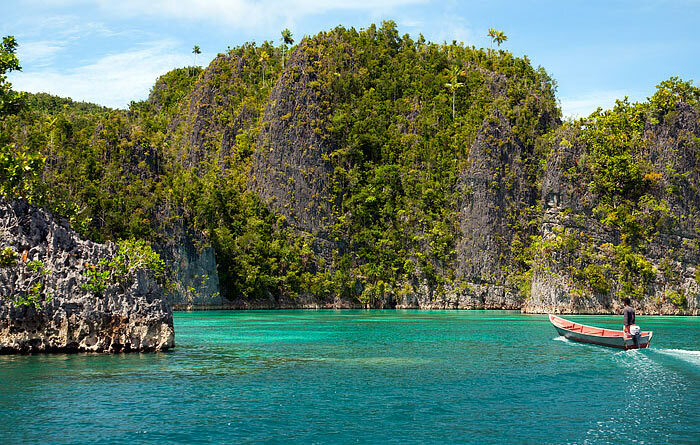 You won’t see a tourism promotion or magazine article about Raja Ampat that doesn’t feature the islands and their surrounding sapphire seas, but Wayag is not easy to get to and is very expensive to visit. Lying northwest of Waigeo, the islands are a round trip of over 300km (~200 miles) from Waisai. There’s no homestay accommodation in there either, so if you want to visit you’ll be up for a long day trip from wherever you are staying. 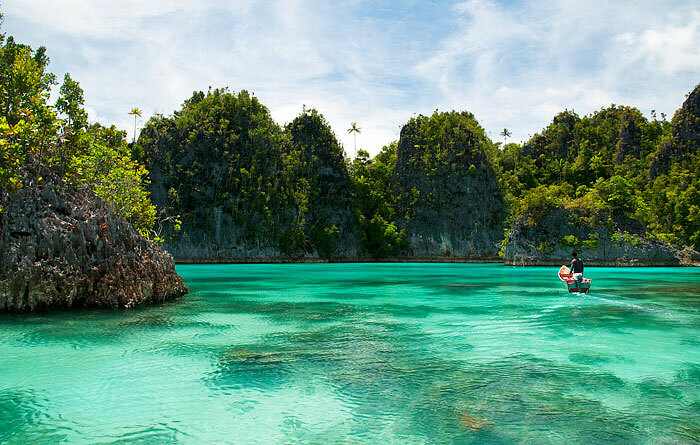 While the spectacular islands are without a doubt the subject of the most commonly seen photographs of Raja Ampat and are the number one item on most visitors’ lists of things to see, don’t worry if you find you can’t visit them – very similar iconic views can easily be had elsewhere..
Use the accommodation page search filters to quickly find all homestays that offer Wayag trips. What if I can’t get there? 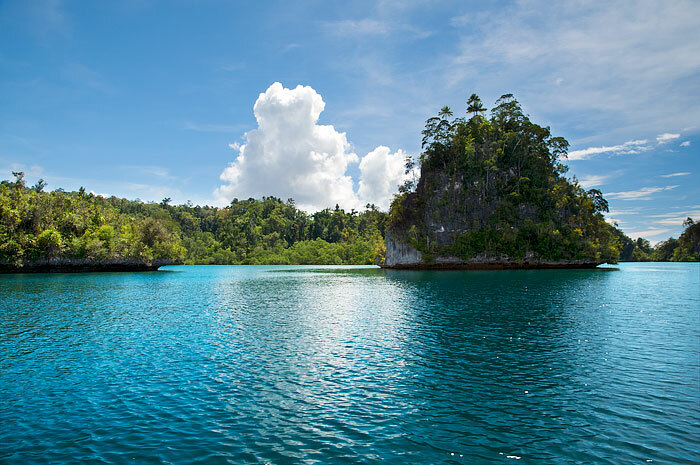 If you find you don’t have time or budget for the trip, the good news is that Raja Ampat has an abundance of spectacular scenery and two locations in particular provide panoramas similar to those of the Wayag. Both of these are much closer to Waisai than Wayag and both have the additional benefit of there being homestays available for longer stays in these island wonderlands. 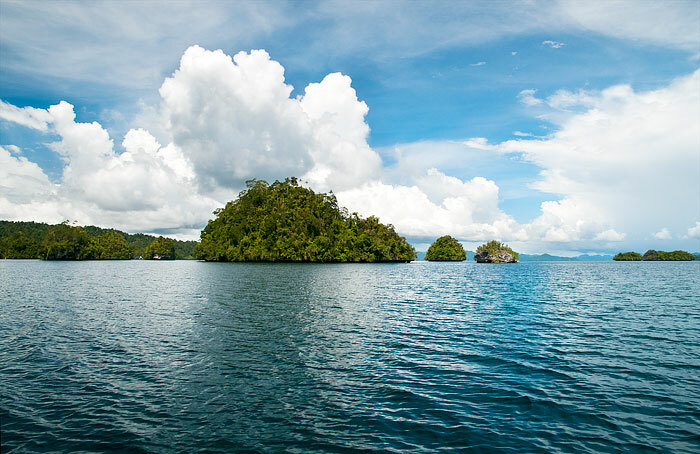 Piaynemo is the correct local spelling of the name of the island marked on most maps of Raja Ampat as “Penemu”. Penemu is about 60km (~40 miles) west of Waisai and has a karst island seascape very similar to that of Wayag (see the photo at the top of this page). If you’re staying on Arborek or near Sawinggrai on Gam, Piaynemo can be reached by 15HP longboat in about 90 minutes. Half that if you want to pay for a speedboat. Check out Piaynemo Homestay’s page if you’d like to organise a stay at Piaynemo. Almost all the homestays on the website can organise day trips to Piaynemo, but (apart from Piaynemo Homestay) the ones in the Pam Islands are the closest. 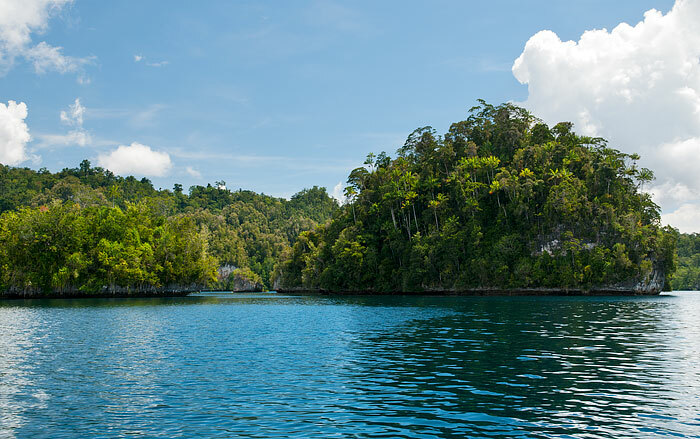 Only 30 kilometres (~20 miles) from Waisai are the karst islands of eastern Kabui Bay. 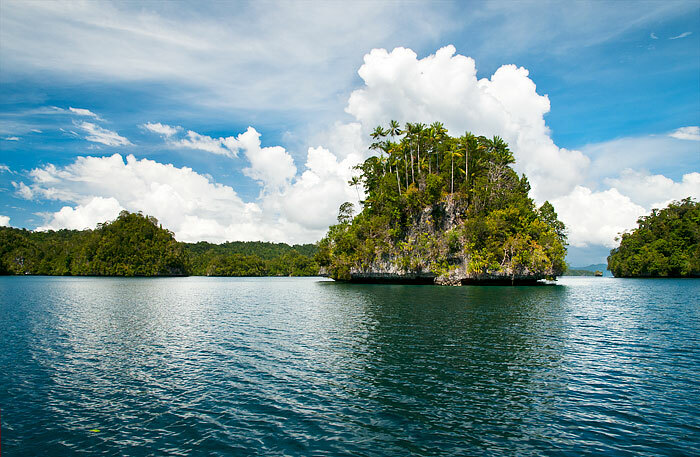 These are perfect if you have limited time and want to see islands like those of Wayag. 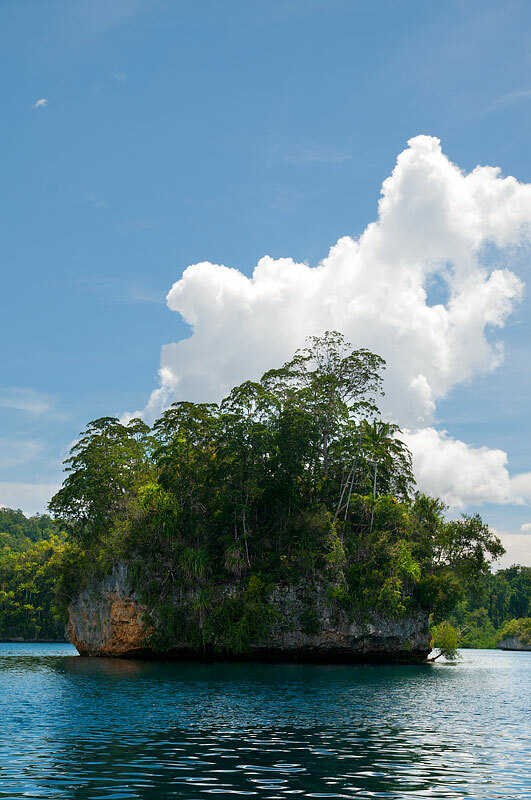 The islands are undercut cones of limestone capped by jungle and festooned with orchids. They lie clustered in the eastern arm of Kabui Bay, close to the entrance to the famed snorkel and dive site of the Kabui Passage. If you want to spend some time exploring the islands and the nearby Kabui Passage, see Warikaf Homestay’s page. 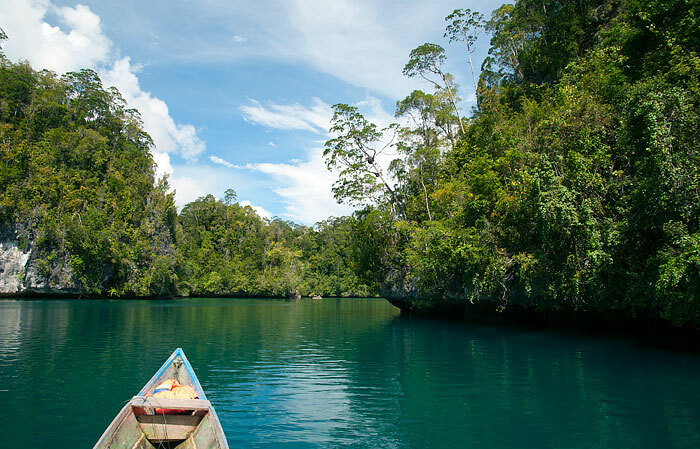 Warikaf occupies a hidden bay on the northern coast of Gam, right in the middle of Kabui’s karst islands. Warikaf’s owner has built a lookout atop one of those, and from that elevation the scenery is even more like Wayag than the photos we’ve used here show. Select the “Wayag trips” search filter on our accommodation page to quickly find homestays offering Wayag tours. Visit the Waisai Homestay Information Center and ask about organising a trip. 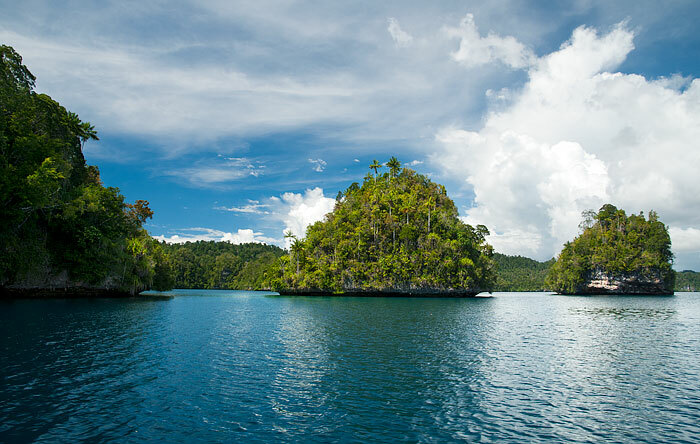 Join a liveaboard boat tour that visits the islands. 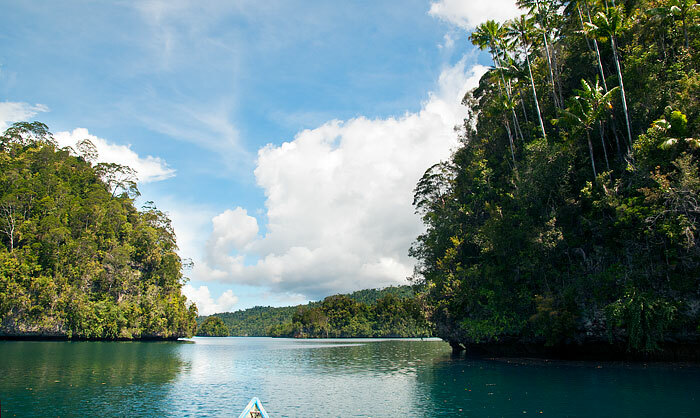 See our high resolution Raja Ampat map to locate the places mentioned in this article. I was just wondering how far Wayag is from Sea Fan homestay? And if there is anything else to see near by, snorkelling spots, islands or beaches to stop at along the way. The “Measure distance” tool on Google Maps says that Wayag is about 60km from Sea Fans, Tyneil. 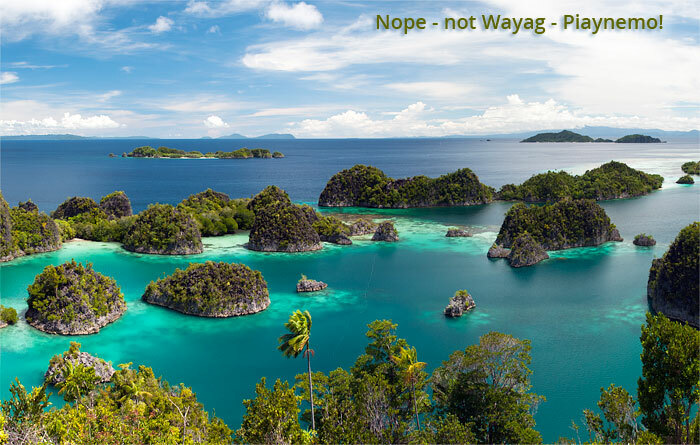 Wayag’s full of snorkelling spots, islands and beaches, so most visitors make a day of it and don’t stop on the way there or back. Detailed information, easily comprehensive, plus amazing pictures. Great website. Congratulations! 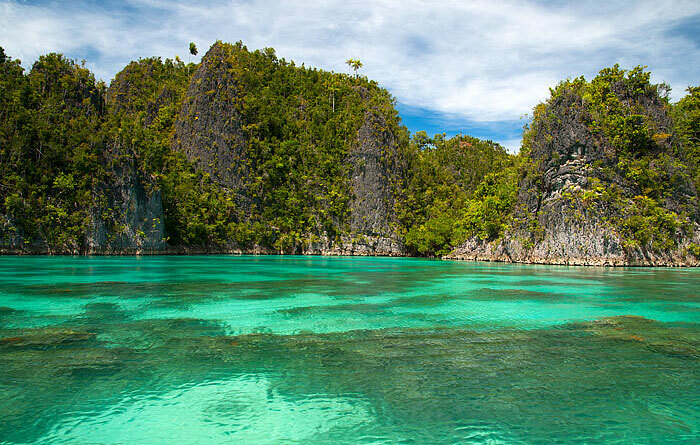 Oh my, I am so happy I found this “Stay Raja Ampat” website. Thank you for being so helpful. I work in adventure / ecotourism and have been blessed to visit 80 countries around the world. I am so happy and excited for my first visit to Indonesia Sept 10 – Oct 7. 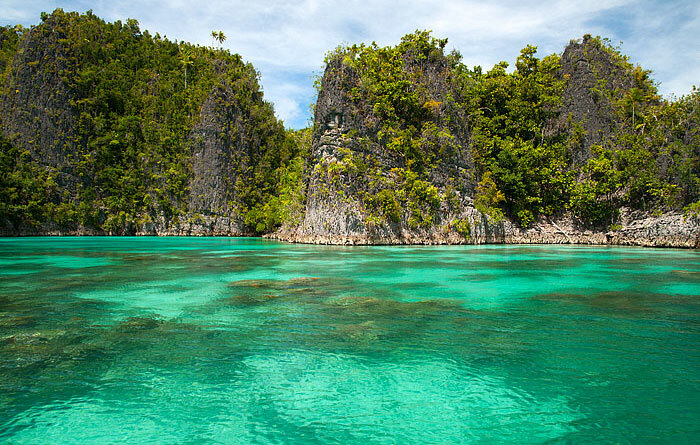 PLAN TO BE IN RAJA AMPAT Sept 30 – Oct 5th (need to fly back to Jakarta on Sept 5th). Really wanted to visit Wayag, but now instead might look at alternatives based on this sites suggestions.